Content from issue 5, November 2013, which has been removed, appears as strikethrough text. Issue 5 of SRSP-502, Technical Requirements for Land Mobile and Fixed Radio Services Operating in the Bands 806-821/851-866 MHz and 821-824/866-869 MHz , has been released to provide a channel plan for narrower channels and to update technical provisions. International obligations for sharing of the bands 806-821/851-866 MHz and 821-824/866-869 MHz along the Canada‑United States border regions have also been updated. This issue replaces SRSP-502, issue 4. This Standard radio system plan (SRSP) states the minimum technical requirements for the purpose of efficient spectrum utilization for land mobile and fixed point‑to‑point systemsFootnote 1 operating in bands 806-821/851-866 MHz and in the public safety bands 821-824/866-869 MHz. Radio systems conforming to the requirements contained in this SRSP will take priority in licensing and coordination over non‑standard systems proposed for operation in these bands. However, the use of more spectrally efficient technologies is strongly encouraged. Different channelization from what is described herein may be considered if it results in increased spectrum efficiency. Such systems would be authorized on a standard basis. The arrangements for non‑standard systems are outlined in spectrum utilization policies SP Gen, General Information Related to Spectrum Utilization and Radio Systems Policies . Existing radio systems operating in the paired bands 806-821/851-866 MHz and 821-824/866-869 MHz that were licensed as standard prior to the issuance of this SRSP may continue to operate as standard. Extension or expansion of these systems will be considered by Industry Canada on a case‑by‑case basis. New systems must conform to the requirements of this standard. Equipment used for land mobile or fixed systems operating in the bands 806–821/851–866 MHz and 821–824/866–869 MHz must comply with appropriate technical standards listed in section 3. A technical acceptance certificate (TAC) is required for the equipment if the applied radio standards specification appears on the Category I equipment standards list. 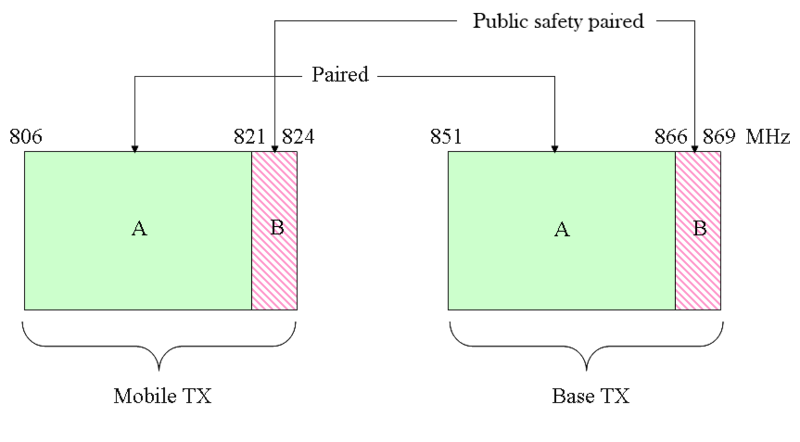 Although a radio system conforms to the requirements of this SRSP, the Department may require modifications to the system whenever harmful interferenceFootnote 2 is caused to other radio sites or systems, except when such interference is due to inadequate receiver selectivity as discussed in the following paragraph. The Department reserves the right to limit protection to licensed radio receivers, only to the extent of the bandwidth of the transmitters whose emissions they are licensed to receive. Licensees and/or applicants should use receiver selectivity characteristics or filters that reject harmful interference. Systems that employ a base station as an automatic repeater station shall transmit on frequencies identified as base transmit frequencies. Dispatch stations (often referred to as control stations) operating through an automatic repeater station shall transmit on frequencies identified as mobile transmit frequencies. Simplex frequency operations using the base/repeater transmit frequency (known as repeater talk around) may be permitted within the authorized service area at the discretion of the system operator. These operations will be licensed on a no‑interference, no‑protection basisFootnote 3 to the other users in the case of a radio service provided by a radiocommunication service provider. Such operations may be licensed on a case‑by‑case basis beyond the service area of a duplex frequency system as an adjunct to operations. The public safety interoperability channels are exempt from this restriction. Very low‑capacity fixed systems may be authorized in these bands on a secondary no‑interference, no‑protection basis in accordance with the appropriate Radio systems policies (RPs) and should be in accordance with applicable technical provisions of SRSP‑507, Technical Requirements for Line‑of‑Sight Radio Systems Operating in the Fixed Service in the Bands 932.5-935 MHz and 941.5-944 MHz . The current issues of the following documents are applicable and are available on Industry Canada's Spectrum Management and Telecommunications website. Frequencies shall be assigned in accordance with annex A and annex B. Chart: This chart shows the paired frequency blocks for land mobile operation in the bands 806 to 824 MHz and 851 to 869 MHz. Frequencies from 806 to 824 MHz will be used for mobile station transmissions, whereas frequencies from 851 to 869 MHz will be used for base station transmissions. Block A is from 806 to 821 MHz paired with 851 to 866 MHz. Block B is from 821 to 824 MHz paired with 866 to 869 MHz and is designated for use by public safety services. Category 1 system operators are eligible for trunked or conventional systems. Category 2 system operators are eligible to share trunked systems with Category 1 users provided that the latter remain the major users of the system. Major users are agencies which have priority over other types of users on the system. Category 2 system users would not be eligible to operate their own systems within the bands 821-824 MHz and 866-869 MHz unless the local spectrum management office is satisfied that their operation would not preclude the future introduction of a Category 1 system. Category 3 system operators and selected supervisory personnel of non‑government agencies (e.g. hydro and gas utilities) may be permitted access to public safety systems during emergency situations where their access will be controlled by the major users operating those systems. For the bands 806-821 MHz and 851-866 MHz, channels shall be spaced 25 kHz, 12.5 kHz and 6.25 kHz apart, centred on the frequencies as indicated in table A1 of annex A. Channel series AA, AB and AC correspond to channel bandwidths of 25 kHz, 12.5 kHz and 6.25 kHz respectively (see figure 2 below). Channels will be assigned according to the required bandwidth of the system.Footnote 5 However, meeting a minimum spectrum efficiency standard data rate of 4.8 kbps per 6.25 kHz bandwidth or at least one voice channel per 12.5 kHz bandwidth is strongly encouraged. Chart: This chart shows an example of the two‑frequency (duplex) channel plan for the band 806 to 821 MHz paired with the band 851 to 866 MHz. There are three channel series AA, AB, and AC that correspond to a channel bandwidth and spacing of 25 kHz, 12.5 kHz and 6.25 kHz respectively. The example shows channels AA3 to AA5 centred from 806.0625 to 806.09375 MHz inclusive; AB5 to AB10 centred from 806.0625 to 806.09375 MHz inclusive; and AC10 to AC20 centred from 806.0625 to 806.009375 MHz inclusive. Only mobile station frequencies are listed. The paired base station frequencies are 45 MHz higher. For the bands 821-824 MHz and 866-869 MHz, channels shall be spaced 12.5 kHz and 6.25 kHz apart, centred on the frequencies as indicated in table B1 of annex B. Channel series BA, BB and BC correspond to channel bandwidths of 25 kHz, 12.5 kHz and 6.25 kHz respectivelyFootnote 6 (see figure 3 below). Channels will be assigned according to the required bandwidth of the system. Meeting a minimum spectrum efficiency standard data rate of 4.8 kbps per 6.25 kHz bandwidth or at least one voice channel per 12.5 kHz bandwidth, as noted above, is strongly encouraged. 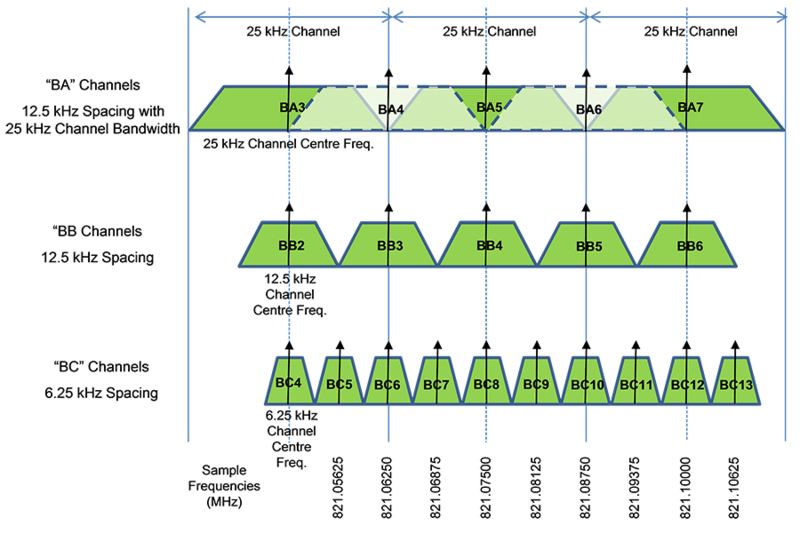 Chart: This chart shows an example of the two‑frequency (duplex) channel plan for the band 821 to 824 MHz paired with the band 866 to 869 MHz. There are three channel series (BA, BB, and BC) that correspond to channel bandwidths of 25 kHz, 12.5 kHz and 6.25 kHz respectively. The channel spacing for the BA and BB channel series is 12.5 kHz; and the channel spacing for the BC channel series is 6.25 kHz. The example shows channels BA3 to BA7 centred from 821.05 to 821.1 MHz inclusive; BB2 to BB6 centred from 821.05 to 821.1 MHz inclusive; and BC4 to BC13 centred from 821.05 to 821.10625 MHz inclusive. Only mobile station frequencies are listed. The paired base station frequencies are 45 MHz higher. The channel spacing between associated mobile and base station centre frequencies is 45 MHz. Frequency reuse is required in systems where many frequencies may be licensed to one licensee. Frequencies in the bands 806-821/851-866 MHz and 821-824/866-869 MHz may be assigned for simplex operation, on a standard or a non‑standard basis at the discretion of the local spectrum management office. See section 5 for provisions related to conventional simplex operations. All channel usage in the Canada‑United States border areaFootnote 7 will be assigned based on the technical and operational requirements outlined in annex C and at the discretion of the local spectrum management office, depending on the local requirements. See annex A for the list of channels in table format for the bands 806-821 MHz and 851-866 MHz. Annex B contains the list of channels in table format for the bands 821-824 MHz and 866-869 MHz. The following 25 kHz wide channels are available to public safety organizations as public safety interoperability channels within Canada. These channels are available for use in all areas and are to be used only for coordination of tactical communications between public safety agencies or within the same public safety agency, or for other similar emergency communications associated with Canadian operations for the preservation of life and protection of property. The channels in table 1 are separated by 500 kHz. Adjacent channels will not be assigned closer than 25 kHz. Calling and tactical channels will be assigned together. Channel numbers correspond to 25 kHz wide channels in the "BA" series, as listed in table B1, annex B. Calling channels are used to establish contact between public safety entities in order for the parties to move to an interoperability channel. These channels are not used as traffic channels. Tactical channels are used as traffic channels. The following 25 kHz wide channels are available as public safety interoperability channels. These channels are available for use within 30 km of the Canada‑United States border in all areas. Interoperability channels are to be used only for coordination of tactical communications between public safety agencies or within the same public safety agency, or for other similar emergency communications associated with Canada‑United States operations for the preservation of life and protection of property. Usage of these channels in the sharing zones may be locally coordinated in accordance with the interoperability requirements of the Canadian and U.S. public safety licensees. Within 30 km of the Canada‑United States border, adjacent channels will not be assigned closer than 25 kHz. Calling and tactical channels will be assigned together. Channel numbers correspond to 25 kHz wide channels in the "AA" series, as listed in table A1, annex A. Continuous tone‑coded squelch system (CTCSS) frequency and modulation: The CTCSS frequency 156.7 Hz will be used on both transmitters and receivers for the interoperability channels listed in tables 1 and 2. Base stations will standardize on analog frequency modulation. Channels BA191 to BA193 are available for conventional duplex or simplex assignments in the bands 821-824 MHz and 866-869 MHz. Additional assignments for conventional systems can be made from available trunked channel groups, where spectrum is available and where justified. As outlined below in table 3, 40 (25 kHz wide) duplex channels are sub‑allocated for wide area radio systems. Thirty more (25 kHz wide) duplex channels may be assigned in each area as specified, for local or wide area systems. Where many blocks of frequencies may be licensed to one holder, assignment of frequencies to each particular site may differ from the block allocation outlined below. Alternative block allocations in such situations will be considered if they improve spectrum efficiency or improve reuse in wide area systems. Each frequency for a particular site must be approved by the local spectrum management office, as it will affect the geographic reassignment of that particular frequency unless an arrangement has been made for the use of frequencies within a specified geographical area. Any system using more than three channels at one site should be configured as a trunked system. The interoperability channels listed in tables 1 and 2 will not be counted as channels with respect to trunked systems. As outlined in annexes A and B, the Department has listed, as a guideline, trunking groups for system deployments in the bands. Trunking groups are identified by the first channel number of the "A" series channels. Within the Canada‑United States border area, the number of trunking groups varies depending on the number of channels available (see annex C for border use). For the bands 806-821 MHz and 851-866 MHz, trunking groups are based on 25 kHz wide channels. Spectrum is channelized in five‑channel groups. Within a given five‑channel group, the separation between channels is 250 kHz (see table A4 of annex A). Trunking groups may also be based on narrower channels (i.e. where applicable, channels of bandwidth 12.5 kHz or 6.25 kHz may be used to form trunking groups). For example, to form a trunking group using 12.5 kHz wide channels, trunking group 281 based on the 25 kHz wide AA channel series may be divided to form three new trunking groups based on the 12.5 kHz wide AB channel series.Footnote 9 Similarly, the AC channel series can be used to form five new trunking groups using 6.25 kHz wide channels.Footnote 10 See figure 4. For the bands 821-824 MHz and 866-869 MHz, trunking groups are based on the BA series (i.e. 25 kHz wide) channels. Spectrum is channelized in six‑channel groups. Within a given six‑channel group, the separation between channels is 500 kHz. See table B4 of annex B. Trunking groups in these bands may also be based on narrower channels in the 6.25 kHz wide BC channel series.Footnote 11 See figure 5. An applicant for a trunked radio system may be assigned up to five duplex channels at a time. However, where an application is made for more than five duplex channels to be used on multiple sites, the application will be considered subject to adequate justification being provided. Minimum loading of the existing channels in accordance with section 6 will be a condition for system expansion. Expansion of trunked systems to more channels per group is to be from other trunked system groups with 250 kHz separation higher in frequencyFootnote 12 except where Canadian use in the border area is not sufficient to accommodate a trunking system with 250 kHz channel separation within one group of channels. Here, trunking schemes with much closer channel separation than 250 kHz are feasible and would be considered. For the bands 821-824 MHz and 866-869 MHz, groups BA19, BA20 and BA21 are not expandable (e.g. no more groups with 250 kHz separation higher in frequency). Interoperability channels used for trunking systems are assigned on a secondary no‑interference, no‑protection basis to conventional interoperability operations. If interoperability channels are used in a trunking system, they must immediately be released when they are needed for conventional interoperability purposes. The calling channel should not be included in a trunking system. Tactical channels may be included in a trunking system in accordance with the above paragraph. Variations and combinations of the trunking groups can be assigned at the discretion of the local spectrum management office. In areas where there is spectrum congestion, conventional channels may be combined to create trunking groups at the discretion of the local spectrum management office. The assignment of a frequency or frequencies to a holder of a radio authorization does not confer a monopoly on the use of the frequency or frequencies, nor shall a radio authorization be construed as conferring any right of continued tenure in respect of the frequency or frequencies. Industry Canada will apply the guidelines found in GL-04, Channel Loading Guidelines , in determining the loading of radio channels. In the frequency assignment process, these guidelines may be used in conjunction with current observed channel occupancy data (obtained with automatic occupancy measuring equipment) to determine whether additional channels are required. Such observations will also be used to assess the general loading criteria and the inherent trade-off between sound spectrum management and acceptable grades of service. The Department is using this approach to make frequency assignments, but may also take into account other considerations when assessing the number of radio channels to be assigned to a system. Applicants should provide as much traffic-related data as possible with their application. Within the sharing and protection zones, the ERP will be subject to the limitations in tables C3 and C4 of annex C. Outside the sharing and protection zones, the ERP shall be limited to that necessary to provide the required service as determined by the system requirements. Systems requiring an ERP greater than 125 watts may require additional justification and will be considered on a case‑by‑case basis by the local spectrum management office. Normally, the minimum geographic separation between co‑channel base stations of different networks will be calculated based on a non‑overlap of the 40 dBμV/m protected contour of the existing station and the 22 dBμV/m interference contour of the proposed station. This criterion is not applicable to systems operating on the same channel (vertical loading) within the same service area. Fixed systems are authorized on a secondary no‑interference, no‑protection basis with respect to land mobile systems. See section 2 for additional details. As defined in the Radiocommunication Act , harmful interference means an adverse effect of electromagnetic energy from any emission, radiation or induction that (a) endangers the use or functioning of a safety‑related radiocommunication system, or (b) significantly degrades or obstructs, or repeatedly interrupts, the use or functioning of radio apparatus or radio‑sensitive equipment. 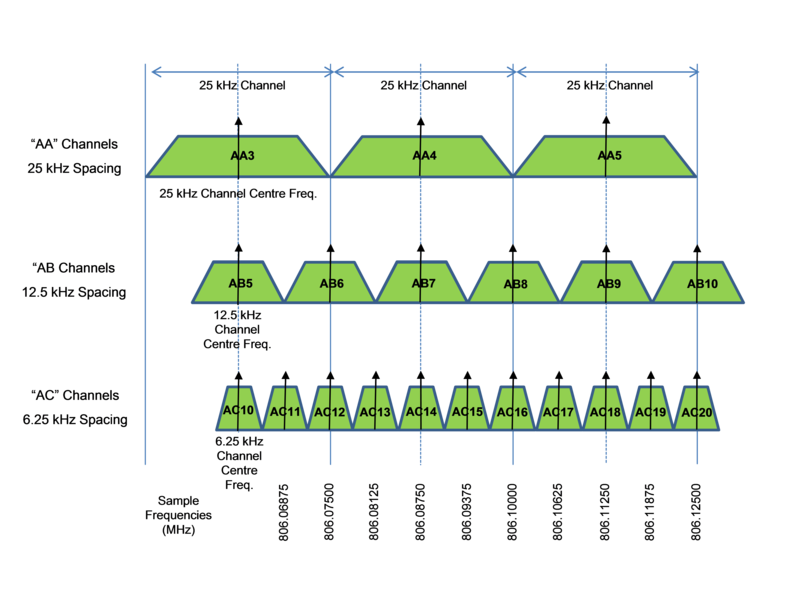 Typically, systems requiring a channel bandwidth of 12.5 kHz, regardless of their spectrum efficiency, will be assigned frequencies in the "AB" series. The legacy channel plan for the bands 821-824 MHz and 866-869 MHz provided 25 kHz channel bandwidth on all channels spaced 12.5 kHz apart so that channels were interstitial or overlapping. Geographic separation between adjacent base stations using 25 kHz channel bandwidth in the "BA" channel series is required. Usage in the Canada‑United States border area is subject to international agreements between the two countries. Conditions may be added during the term of the licence if required by the terms of international agreements between the governments of the United States and Canada. The availability of the new 12.5 kHz trunking group (e.g. AB560 and AB562 in figure 4) is dependent on the adjacent trunking group use (e.g. AA280 and AA282, not shown). The availability of some of the new 6.25 kHz trunking groups (e.g. AC1123 and AC1124 in figure 4) is dependent on the adjacent trunking group use. As the 25 kHz wide BA channel series is spaced 12.5 kHz apart, only two new trunking groups can be formed based on the 6.25 kHz wide BC channel series. For example, trunked group BA2 can be expanded from group BA22 (e.g. 250 kHz separation), group BA3 can be expanded from group BA23, etc.